Since yesterday summer has finally arrived here in Berlin! It´s 22°C each day this week and I think during the weekend it´s supposed to get even warmer. Yay! 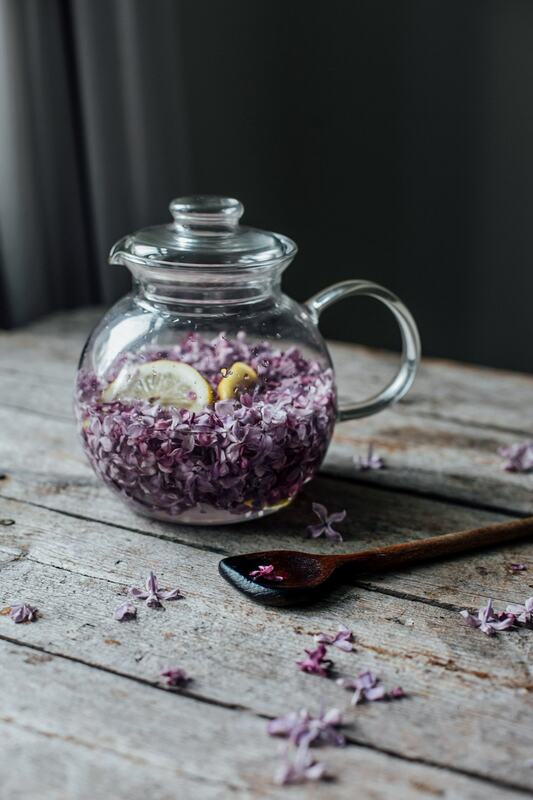 Perfect timing that we share this easy and delicious lilac syrup recipe with you guys. 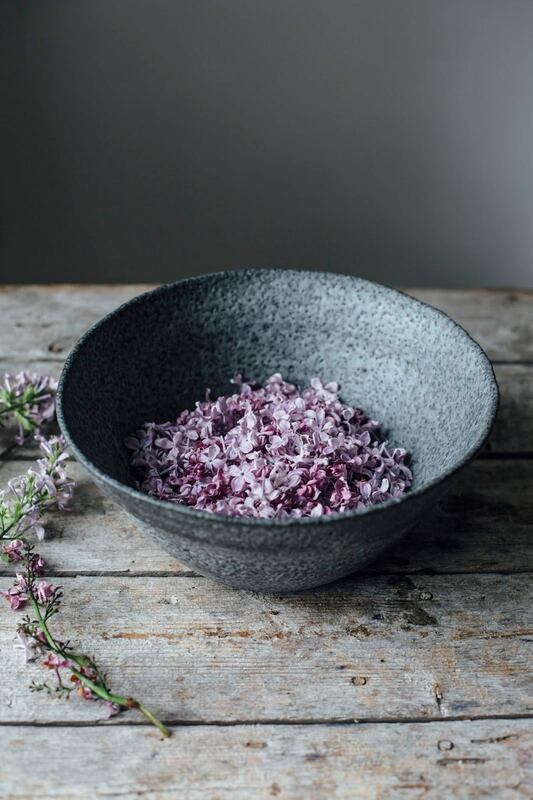 As we already told you in the last post we are totally in love with lilacs. For us it feels almost magical when they start blooming each year again and smell so marvellous. 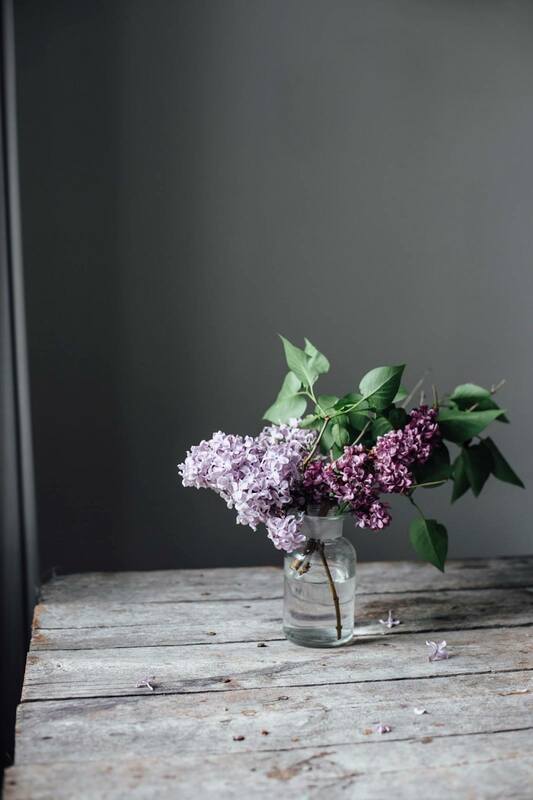 the best thing is, that there are a lot of lilacs growing in our garden, so when they are blooming we always bring a lot of them inside the house, that even inside everythings starts to smell so good. 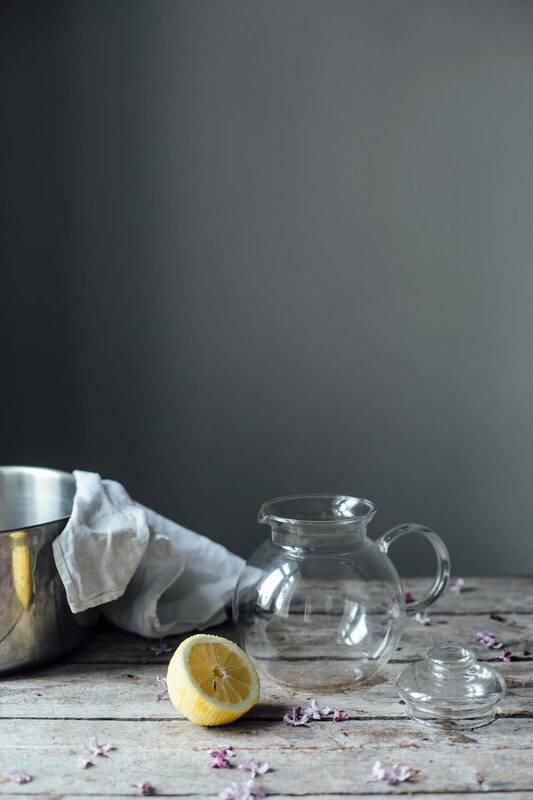 you can use this syrup for so many things – for example cake, yoghurt, frostings or simply just put it in your water on a hot summer day. 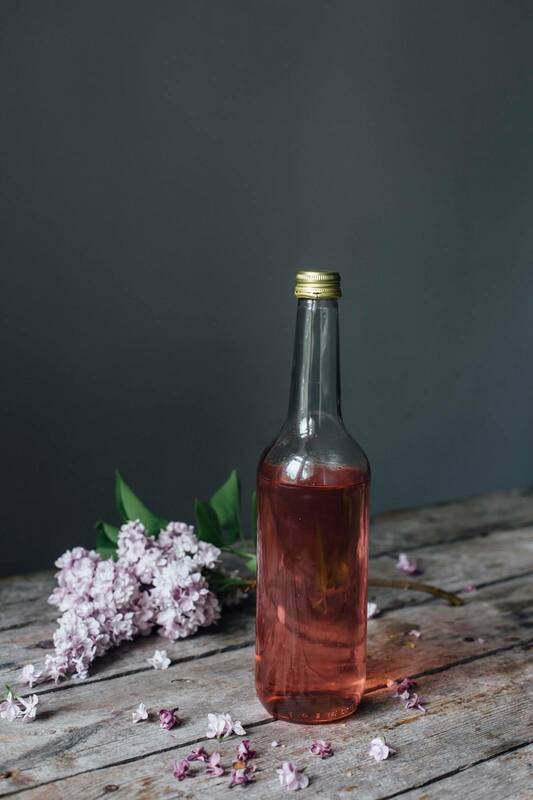 but no worries – if you need more inspirations how to use this delicious syrup: one of the next recipes will involve lilac syrup for sure! 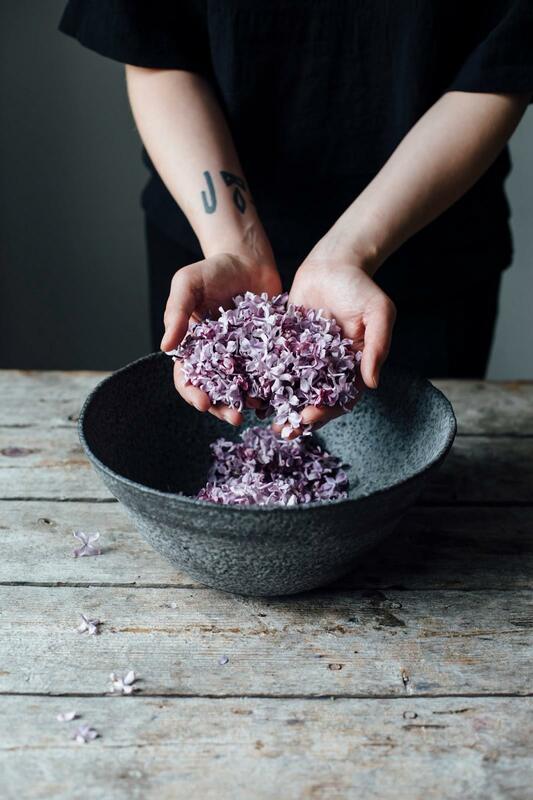 pick the lilac stems in the morning or noon, then they release the best flavor. shake for a minute the stems, so insects can fall out. remove the blossoms (also check for insects), but do not wash them. also make sure, that no green parts at the blossoms are left, because they will give a bitter taste to the syrup. then heat the water together with the sugar until the sugar is dissolved (let the sugar-water simmer for 2minutes). 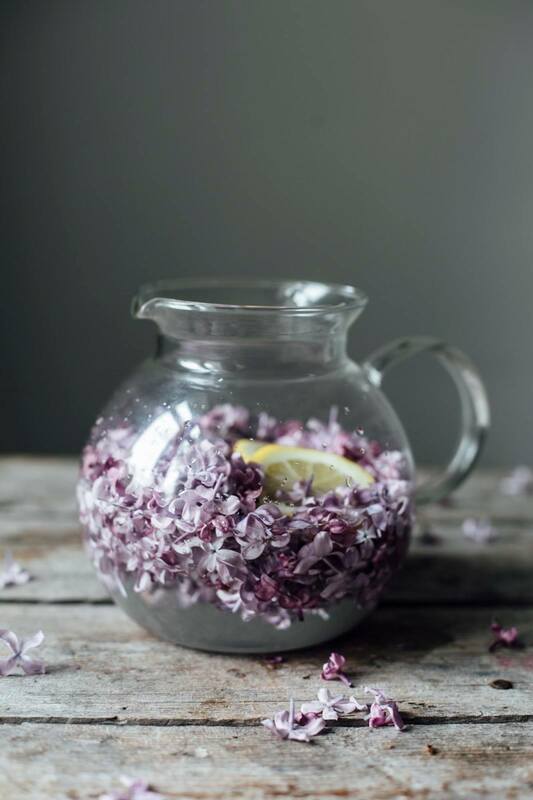 fill the sugar-water into a jar or pot, then add the blossoms and lemon slices. stir the liquid so all blossoms are covered with syrup. 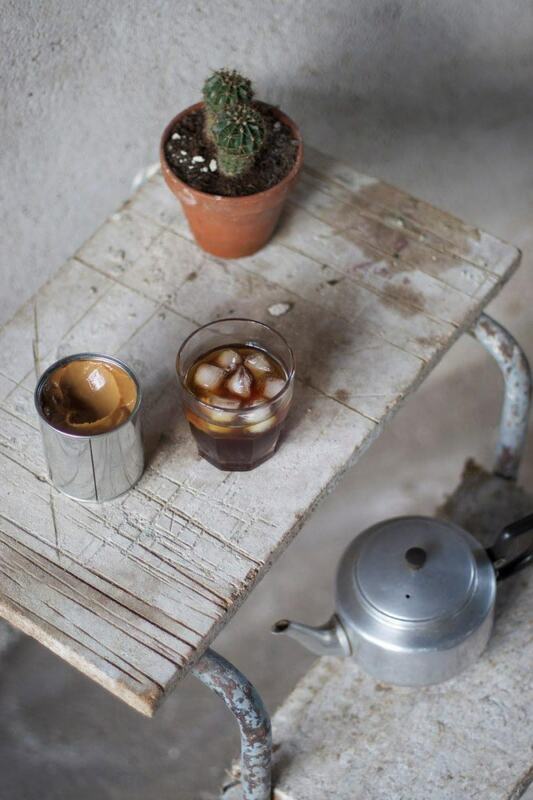 put the lid on top and leave in a cool place for 5-7 days (we did 6 days and left the carafe in the fridge). stir everyday twice the syrup. after the time sieve the syrup and fill into bottles. seit gestern ist es schon richtig sommerlich in berlin. die ganze woche sind 22 grad vorhergesagt und am wochenende soll es sogar richtig heiß werden! juchu! perfektes timing euch unseren fliedersirup vorzustellen. wir haben euch ja schon im letzten post von unserer großen flieder-liebe erzählt. es ist jedes jahr auf neue fast magisch für uns, wenn der flieder wieder beginnt zu blühen und seinen wunderbaren geruch verströmt. das beste ist, dass auch noch viele fliederbüsche in unserem garten blühen. wir pflücken dann oft ganz viele zweige und dekorieren damit alle Zimmer, sodass der fliedergeruch durchs ganze haus zieht. den sirup kann man ganz vielfältig verwenden – z.b. für kuchen, joghurt, frostings oder ganz einfach um sein wasser ein bisschen aufzupeppen. 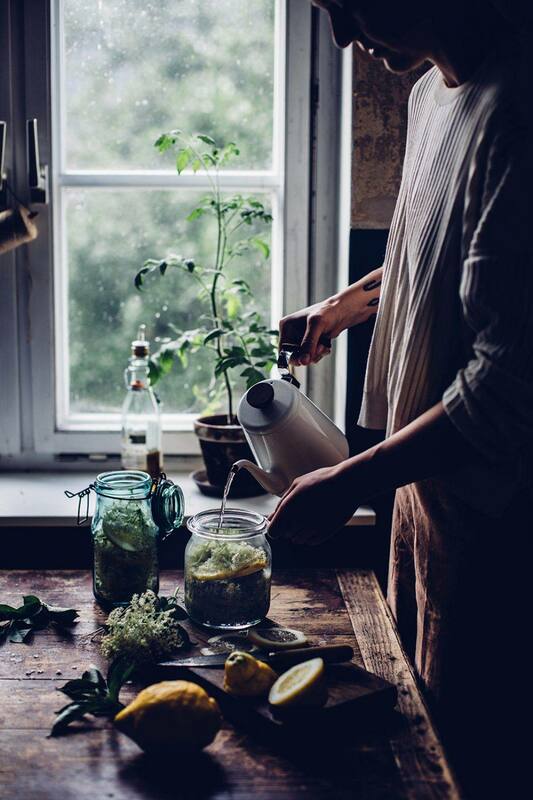 aber keine sorge wenn ihr noch mehr inspirationen braucht – in einem der nächsten rezepte auf dem blog wird der köstliche sirup sicherlich involviert sein. die fliederblüten am besten am vormittag oder mittag pflücken, dann haben sie das beste aroma. die dolden etwas schütteln, sodass insekten herausfallen können. die blüten abzupfen (nochmals auf kleine insekten achten), aber nicht waschen. auch sollten keine grünen enden an den blüten sein, da sie einen bitteren geschmack abgeben. nun wasser und zucker erhitzen und für 2 min köcheln lassen bis der zucker sich vollständig aufgelöst hat. 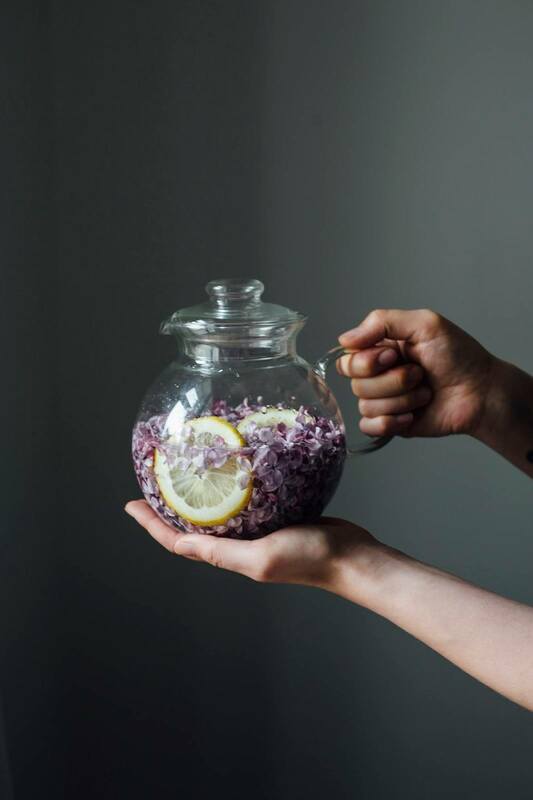 das zuckerwasser in ein gefäß oder einen topf füllen, dann die blüten und zitronenscheiben dazugeben und alles umrühren, so dass alle blüten mit sirup bedeckt sind. den deckel drauf und für 5-7 tage an einen kühlen ort zum ziehen stellen (wir haben die karaffe in den kühlschrank gestellt und es waren knapp 6 tage bei uns). den sirup jeden tag wenigstens 2 mal kräftig umrühren. 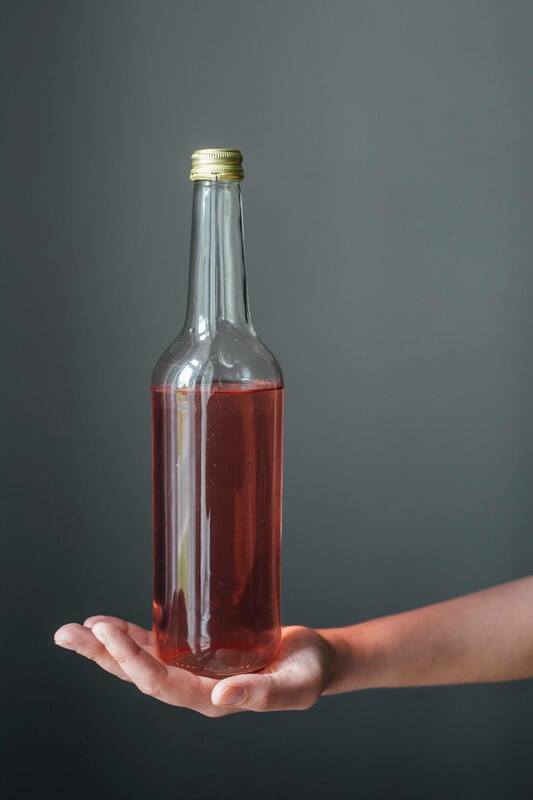 zum schluss die blüten und zitronen absieben und den sirup in flaschen füllen. We had a big storm here yesterday but at the end of the week summer will begin in Holland too. And i never knew you can eat lilacs as well. The photo's are so beautiful. Will try this for sure. The house I grew up was surrounded with beautiful lilacs. Around this time of the year, the minute you go out of the house you would be welcomed with the incredibly beautiful smell of this delicate flower. I wonder why my mother never made a syrup out of it. But I will.. Thanks to you! Ich hab gar nicht gewusst das es Fliedersirup überhaupt gibt, aber hört sich auf jeden Fall unglaublich lecker an. V,a. weil ich Flieder so liebe. It's really beautiful and I'm so happy for you that summer is here! 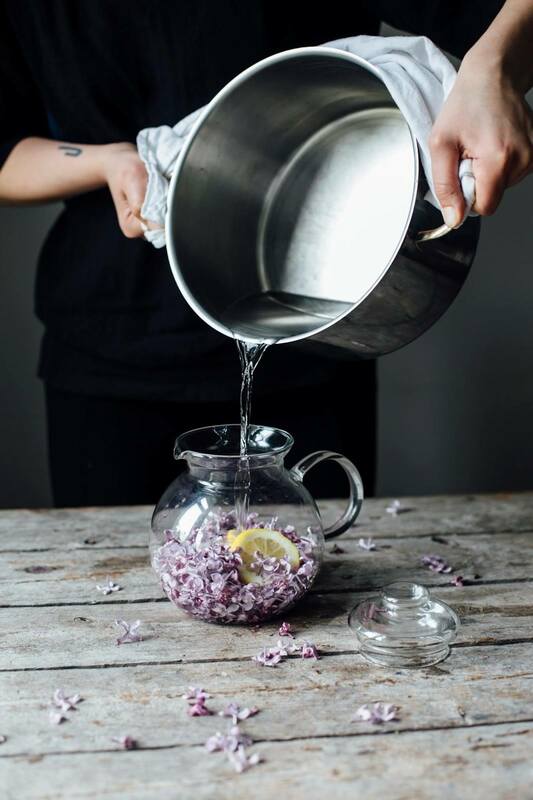 Can't wait to see how you all use Liliac syrup! Ich habe wirklich noch nie von Fliedersirup gehört, aber es hört sich wirklich köstlich an. V.a. weil ich Flieder sooo liebe. These photos are so lovely, girls! 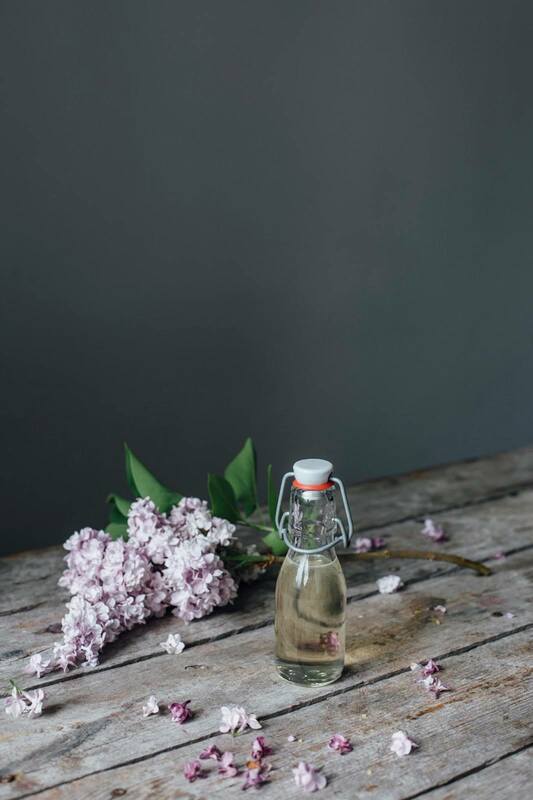 I picked some lilacs in the countryside this weekend as well and made a little bouquet for a shoot. Brought them home to Copenhagen and after one day, they died! ;-( Hopefully they will still be around next time I go up there, then I will try this!! I love this! What a genius recipe. The most beautiful syrup ever!!! I have to look at these beautiful photos for a long while before I could imagine myself having this syrup with tea, breakfast etc. I can almost smell its fragrance from here. Now all I have to do is find the organic lilac. same here, the house were i grew up is surrounded with lilacs as well - it´s the best!! thanks dear suus!! if summer is there at least at the weekend, it sounds perfect to me :) oh yes, give it a try, it´s so easy! 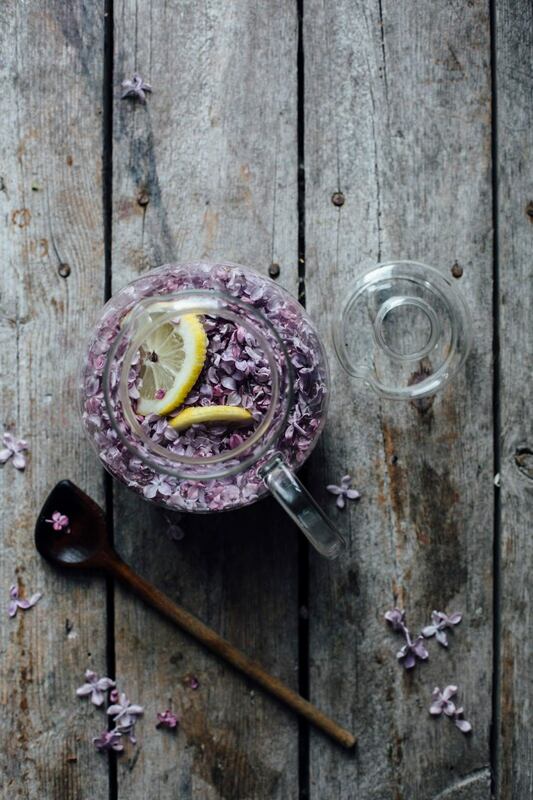 I bet the lilac syrup us delicious buy gosh it's just too pretty!! 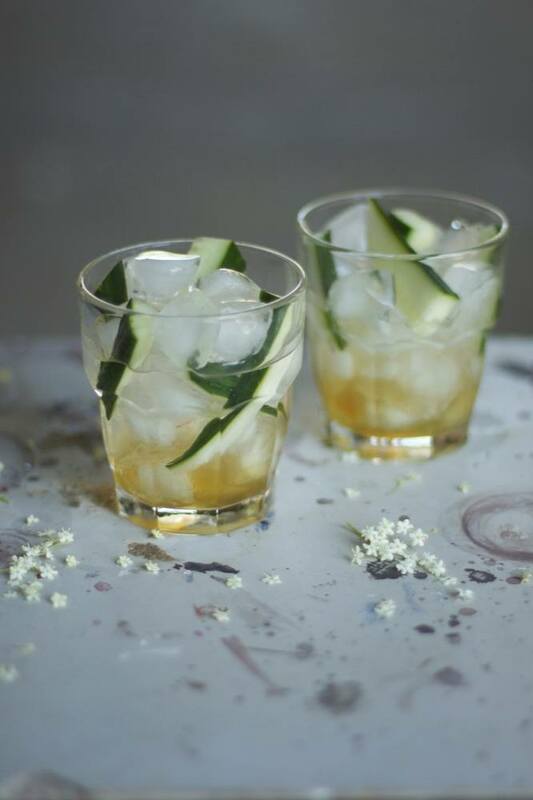 I'm so happy I found your blog some time ago, because I'm suffering from gluten intolerance as well and couldn't find any pretty and a bit more sophisticated gf recipes. This post is, as all others, super awesome and I already made a version of this recipe. Yummy! But I am curious if you ever tried to make gf wraps? That's the thing I find the hardest to make. If yes, I would be above pleased if you would share it with all of us. Hallo ihr Lieben, vom Fliedersirup habe ich noch nie gehört. Durch euch wird man wieder schlauer. Ich liebe Flieder. 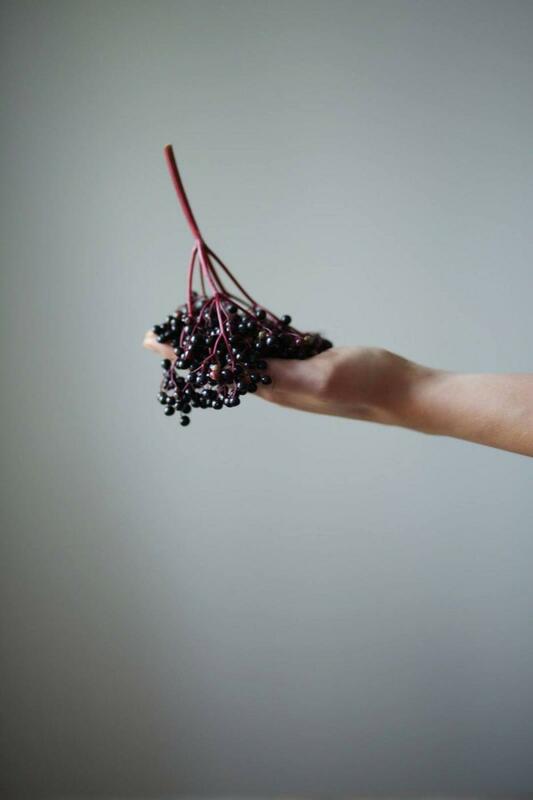 Tolle Bilder. I grew up with lilacs everywhere in the fields by my house. The smell and sight of them still fill me with the euphoria of spring's first scent. I feel cheated I've never known they can be consumed. Pretty post, cannot wait till next year when they will bloom again in southern Canada . dear mara, thanks so much for your lovely words, so happy to hear that!! Das sieht einfach nur traumhaft aus! Ich bin jedes Jahr total von Fliederblüten fasziniert – dieses Jahr bin ich auch auf kulinarische Highlights, wie Fliederzucker, gespannt. Dieser Sirup wäre perfekt für unser Mittsommerfest nächste Woche! i saw this post just after our lilacs in colorado were off the trees and i have been waiting a year to finally try it!!!! i am so (so) excited. just wanted to ask, is there a specific kind of sugar you use for the syrup? brown or white? thanks! I remember seeing this post on Instgram last year and was excited to try it. I'm on day 2 of the infusion and was just wondering...about how long until the purple color starts to develop? So far I've got just a very yummy tasting clear syrup! I used the purple lilac variety like the one in the your pictures.